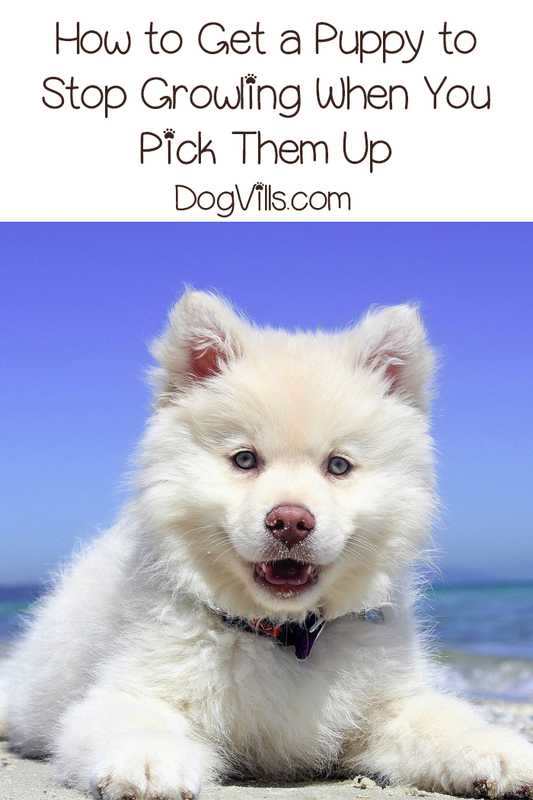 Wondering how to get a puppy to stop growling when you pick them up? This is not an uncommon complaint with pet parents. However, that doesn’t make it any less concerning. We love our fur babies, so for most of us, a puppy exhibiting this “aggressive” behavior can be disturbing. In this post, we will cover the reasons why a puppy growls when being picked up, and some sensible solutions you can use to help curb the behavior. Why Does a Puppy Growl When Being Picked Up? This post contains affiliate links. If you make a purchase through these links, we earn a small commission at no extra charge to you. There are four main reasons why your puppy or dog may growl when being picked up. These include pain or another health issue, a lack of handling, negative experience and/or a negative consequence. Let’s explore these further. If your dog has always been fine when being picked up, then suddenly starts to growl, it could be a sign of pain or another underlying health issue. It could be that Fido hurt his front leg or paw that causes him to be grumpy when in certain positions. A vet check-up can rule out any injuries or health issues that may be making your pooch growl when being picked up. 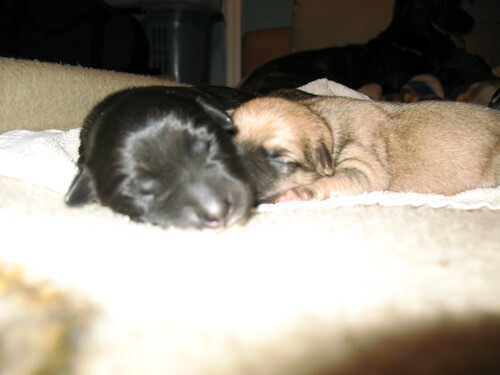 Dogs that have not been adequately handled when still with their mom and litter mates, can exhibit fear and mistrust when being picked up later on in life. This is why it is crucial for breeders to handle and socialize puppies under their care correctly. A puppy that has not been properly handled may tense up, have a rigid body, growl, and even nip when being picked up. If something unpleasant has happened to your puppy during the action of being picked up, he may associate that action with the negative experience. 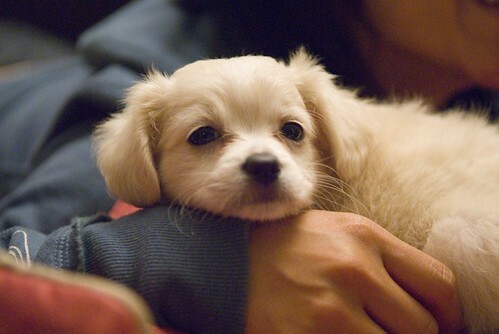 For example, some small dogs are very delicate and may feel pain when being picked up. Others may associate having their nails trimmed with the same action. Although it is not our intent to cause pain or fear in our dogs, in their brains the act of being picked up is associated with their bad experience. Instinctively, animals will exhibit the fight or flight response. Since they cannot flee once they have been picked up, their next reaction is to “fight,” i.e., the growling. 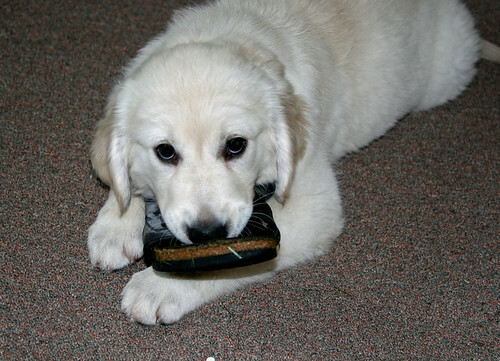 If you are picking your puppy up to interrupt a bad behavior (like chewing your favorite shoes), she could be associating this action with the negative consequences (having to stop doing what she enjoys). If this is the case, you will have to find better ways to interrupt the unwanted behaviors. We want to have a good-mannered and happy puppy, teaching them to tolerate being picked up should be a part of that training. 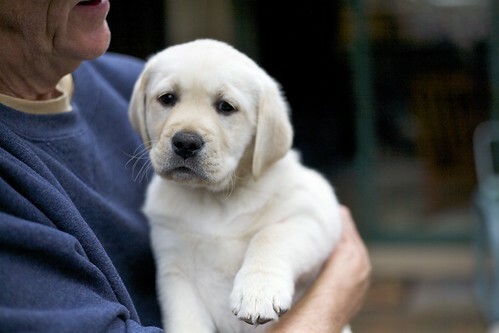 Here are some tips for getting your puppy accustomed to being picked up. 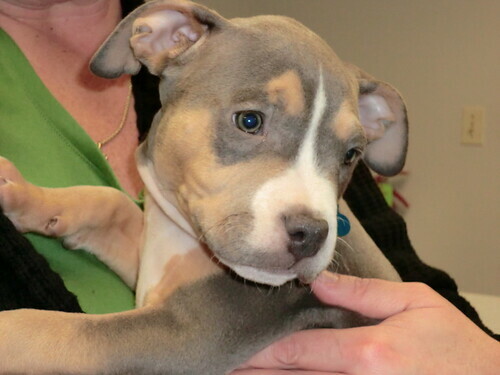 Your puppy may be growling because he doesn’t like the way you pick him up and handle him. Though a common method, most dogs do not want to be lifted up under their arms. This can cause pain and discomfort, especially in smaller breeds. To properly lift a dog, put one hand on the puppy’s chest and stomach and use the other hand to scoop him up by his rear end. This is a safer way to pick up the puppy. When holding the puppy, be sure to cradle him into your chest or abdomen to help him feel safe and secure. This is a proven method for teaching dogs. The foundation of positive reinforcement is to reward good behavior with treats and praise, rather than punish the bad behavior. When your puppy allows you to pick him up without growling or fuss, give him small treat and shower on the praise. Building on the positive reinforcement method is choosing a command for clarity. This one-word (through repetition and consistency) will teach your puppy what you want her to do. When it comes to growling, “Quiet” is the word to use. Once your puppy understands the meaning of “quiet,” it can be used for excessive barking, whining, and other vocalizations – just be sure there isn’t a good reason behind the “noise” before you give the command. When your puppy doesn’t growl when you pick him up, tell him he’s a “good boy” in a soft, soothing voice. You can also give him a pea-size treat to help reinforce the positive action. If your puppy growls while being picked up or held, stop the treats – we want Fido to associate good things with good behavior. Also, do not put him down. If you put Fido down when he’s growling, he will associate this action with his growling, which will only strengthen the behavior, rather than stopping it. Use the “quiet” command after you stopped the treats. Use a stern tone, but not overly loud or aggressive (this will scare the puppy). Use the command once and wait for the puppy to comply. Repeating the command over and over will only make it harder for the pup to associate it with the desired behavior. After the puppy stops growling for several seconds reward him with more treats and praise. You may have to wait for a minute or so, but as soon as he stops, give him the treats and praise. It won’t happen instantaneously, but your puppy will begin to realize no growling means treats. Always be sure to end these training sessions on a positive note. Even if you’re ready to put your pet down, make sure he has stopped growling and has had his treat before relinquishing him to the floor. When training your puppy always use patience and consistency, giving your pet mixed messages will only confuse your dog and prolong the training. Also be sure everyone in the home is using the same methods. You will want the behavior to be performed because your pooch has learned, not because he is being given food. To achieve this, slowly decrease the number of times he gets a food treat. You can swap out food for a favorite toy and praise. Before you begin training your puppy not to growl be sure the problem isn’t caused by an underlying health issue or an injury. Once your pup has a clean bill of health, follow these tips for how to get a puppy to stop growling when you pick him up. Do you have a puppy or dog that growls when you pick him up? Tell us your tips on how to get a puppy to stop growling! 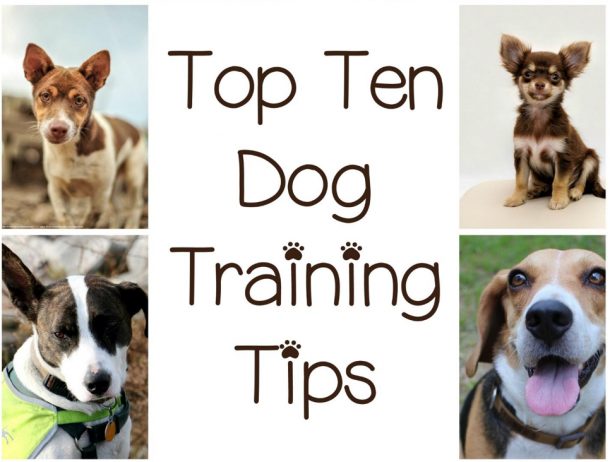 Want More DOG Tips & Tricks? Get Weekly Tips! No Spam Ever. Sandie lee has been writing for 20 plus years. She hails from a small town in Ontario Canada with her three rescue felines and a Hubby of 16 years. When she's not writing or playing with her fur babies she loves to hike and watch NetFlix. 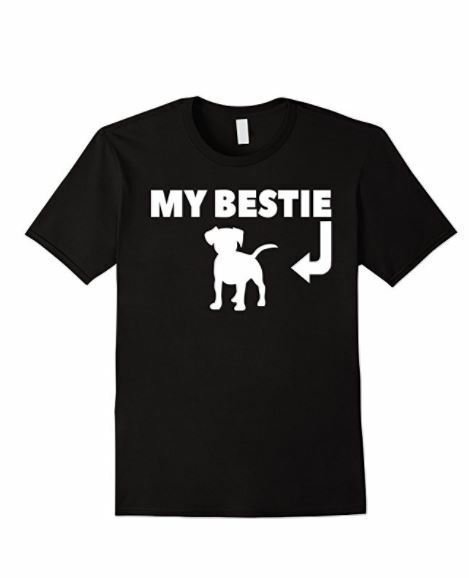 Dogvills is a participant in the Amazon Services LLC Associates Program, an affiliate advertising program designed to provide a means for sites to earn advertising fees by advertising and linking to (“Dogvills” (amazon.com, or endless.com, MYHABIT.com, SmallParts.com, or AmazonWireless.com).